Michael Torke: Bright Blue Music – Prokofiev: Extracts from Cinderella and *Violin Concerto No.2 – Callum Smart (Violin), Liverpool Philharmonic Youth Orchestra conducted by Dane Lam and *Vasily Petrenko. The LPYO always manage to pull off performances to a high standard but, when given the added inspiration of working with such prodigious talent as the astounding 17 year old violinist Callum Smart and a conductor of the calibre of Vasily Petrenko, then our expectations can be set very high. It was such a shame that the audience for this Sunday evening concert was so thin on the ground, as it was an interesting and challenging programme and one that delivered on its promises. Torke’s series of colour pieces are all, dare I say, colourful, and make great concert openers. Bright Blue Music is one of the liveliest, with lots of syncopated and angular rhythms, and it is not the easiest of things to play coherently. Whilst there may have been some awkward articulation, especially in the strings, the orchestra played with enthusiasm and the performance was committed, if lacking a little in detail and focus. Much more convincing was the substantial selection of extracts from Prokofiev’s ballet score for Cinderella. There was plenty of orchestral colour and the LPYO handled Prokofiev’s difficult rhythmic shapes well. The woodwind especially gave some very fine playing, while the large percussion section were in their element in this music, reminding me of the fact that a certain Mr Rattle used to play in that department of this orchestra some years ago. 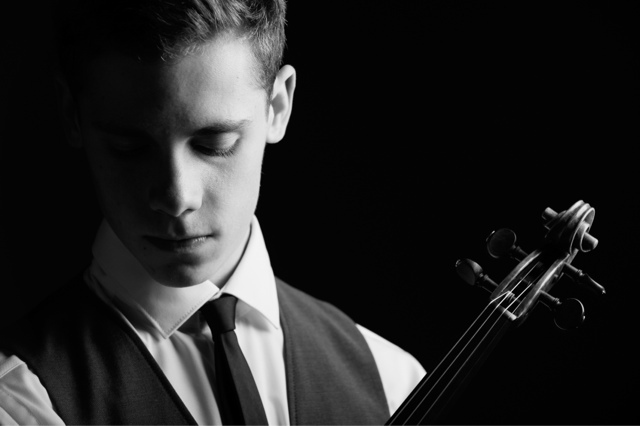 Callum Smart was only 13 when he won the string finals of the BBC Young Musician of the Year in 2010 and has been making quite an impact since then. Vasily Petrenko conducted the orchestra for the concerto finals in that competition and was so impressed that he has been keeping an eye on the development of this young soloist’s career since. It was Vasily who invited Callum to play this concert with the LPYO and he took over the baton from their regular conductor Dane Lam after the interval, to direct the orchestra in Prokofiev’s 2nd violin concerto. Wherever the inspiration came from, the LPYO seemed to step up to another level in the concerto giving very crisp and well focused sound and accompanying the soloist beautifully, which is no mean feat in a work of such contrasting styles and rhythms. Callum chose the concerto himself, and although this is apparently the first time he has played it with an orchestra he gave a most compelling reading of it. His remarkable technical skill is matched by a tremendous musicality, and he really brought out the beauty of the work as well as its fire and energy. He has a very engaging presence on the stage, with a relaxed and not at all showy style of playing that makes him easy to watch. Playing from memory and with tremendous confidence it was barely possible to believe that he had not performed it with orchestra before. I suspect that there are a lot of others as well as Vasily who will be following this young man's career with interest, and I do hope it isn't long before we see him on our Liverpool concert platform again.